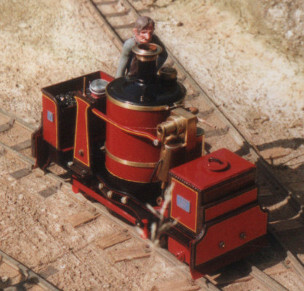 16mm/1ft (1:19) Scale Narrow Gauge. Originally built as a battery powered 0-8-0T in 1972. 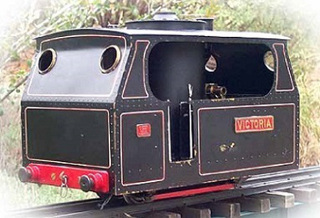 The chassis made from two Triang Big-Big Ruston diesel shunters. Colin was not happy with the locomotive in that form. 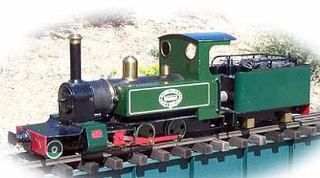 Rebuilt in 1973 as an 0-6-0T with steel chassis and Allen`s straight link valve gear. Batteries abandoned in favour of two rail electric. Persephone was used as a guinea pig for a number of experiments. She was fitted with sound. Having a loudspeaker in the boiler and an electronic `chuffer` triggered by a four lobed cam on the axle. Giving the correct four chuffs per revolution and with control of the rise and decay times of the chuffs it gave a very realistic sound. 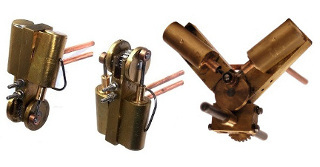 Originally the coupling were mounted on springs with linkages to small potentiometers so the pull on the coupling could be sensed and used to control the volume of the chuffs. The idea being that the harder the loco` pulled the louder it chuffed. That part did not work at all well and was removed. A second chuffer was made with the intention it produced sound for the Westinghouse break pump but lack of space prevented it`s fitting. Electronics circa 1970 was not so miniaturised. The next experiments involved the valve gear. 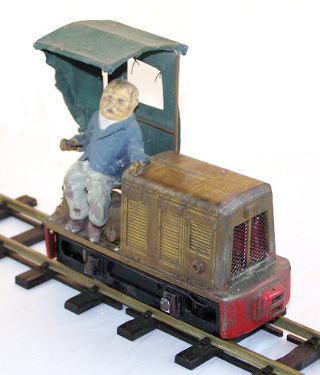 Colin thought it wrong to have a loco running in reverse when the valve gear was in forward gear so a mechanism was devised to move the valve gear into the correct position before the loco` moved off. A small low voltage motor connected in parallel with the traction motor drove a leadscrew and nut. The travel controlled by limit switches with reversing diodes in the normal way. A sprung link between the nut and the weighbar moved the valve gear. Removable working parabolic lamps are fitted. White LED`s were not available in 1973, `grain of wheat` bulbs were used in the lamps. With the coming of the garden railway and live steam a two rail electric was of little use. Persephone was again rebuilt in 1990 as a battery powered R/C tender loco` and renamed Hecate. 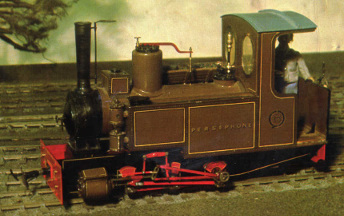 It had to be a tender loco, batteries, R/C receivers, and electronic speed controllers were all so large in 1990. 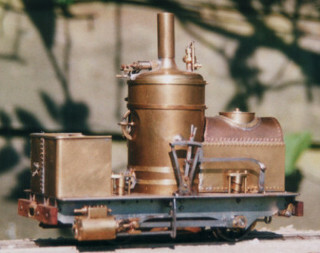 Colin usually constructed his models of sheet brass, nickel silver or sometimes tinplate. Hecate`s bodywork is polystyrene sheet. This has now become so fragile that Hecate will never leave her showcase again. 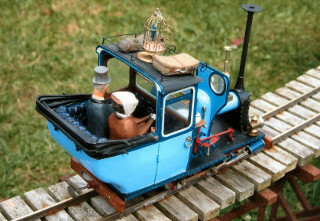 Colin`s 1974 Model Railways article describing the 1973 rebuild can be found on this website. 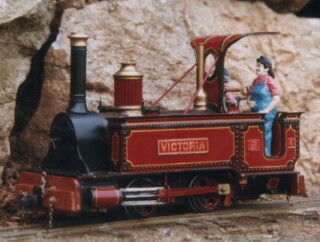 A 16mm scale model of a vertical boiler quarry locomotive. The prototype was tiny, so is the model. 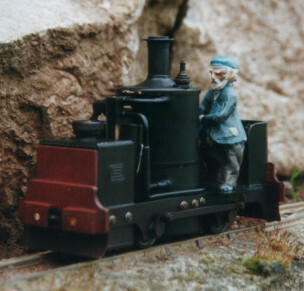 Even with such small boiler and gas tank a run of 15 - 20 minute is usually achieved pulling a dozen or so small quarry wagons. The first one built, 40 years old as I write this, can often be seen running at the Beamish Cog railway 16mm line with my brother Robert. Gas tank one end, dead leg lubricator the other. Ring shaped gas burner and superheater in the bottom of the boiler. Stainless disk shaped flame spreader above the burner. Powered by one of Colin`s steam motors via 1.5 : 1 Meccano gears. The first one was fitted with a standard regulator. It was soon discovered that the reversing valve would operate as an effective regulator so no more were fitted. Twin cylinder double acting oscillating steam unit originally made to power the DeWinton loco`. Cylinders are 3/8 inch bore x 1/2 inch stroke. Between the overhung cranks is a 16 tooth gear which meshes with a gear on the locomotive axle. Meccano gears were used initially but as these became scarce Colin started cutting gears himself. 30 or 40 tooth axle gears were supplied with the standard unit. 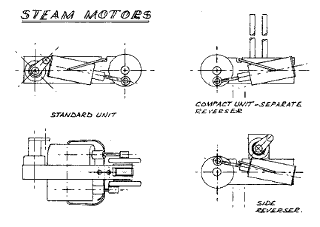 As pictured in the sketch the standard unit had an integral rotary reversing valve. 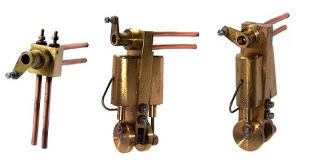 Non standard versions included shorter models with the reversing valve on the side or with the valve as a separate unit. The V2 & V4 models made for Avonside-Heislers found use in a number of model boats. Colin made a few units for Shays with the oscillating cylinders hidden. One even became a pump in a model submarine. 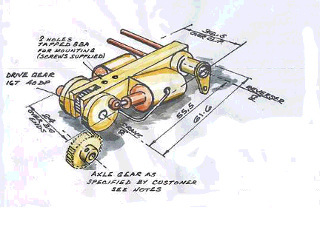 I have not found Colin`s steam motor drawings. There is a drawing in the archives of The 16mm NG Steam Loco Builder Group. Not a Binnie drawing so no enquiries here please. Image © Marc Horovitz, Sidestreet Bannerworks. Powered by one of Colin`s steam motors mounted vertically. Colin`s first model to feature a ceramic gas burner, made from a radiant fire element. When first tested it made a noise like an church organ but a little air gap cured that problem. Colin`s first Mamod conversion. 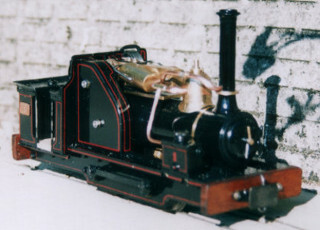 New Steel 2-6-0 chassis and tender. Gas tank and jet in the tender feeding a gas poker between the frames via a length of silicon tube. Longer silver soldered boiler. Dummy cylinders and cross heads hiding the Mamods oscillating cylinders. Inspired by whimsical creations of Rowland Emett. A coreless motor and gearbox is mounted vertically in the firebox. PP9 battery under the seat. All metal construction so not as fragile as it looks. The opening doors have working catches and doorknobs. Complete with teapot, luggage and a parrot in a cage. The curved bodywork panels are of sheet copper repeatedly annealed, stretched and beaten around a wooden form. Padded seats, figures, parrot and teapot made of Holly. Colin`s preferred hardwood for carving. Won the Andrew Neale Challenge Trophy in 2004. Another of Colin`s Mamod conversions, built for his wife Marjorie and named after her mother. Dummy cylinders and crossheads hide the Mamod oscillators. New pot boiler, ceramic gas burner and steam fittings. Distinctive Victorian bodywork, much use of the dummy rivet jig, female crew based on family friends. Made from the body of a broken Triang Ruston diesel and oddments from the scrap box. A small 12V coreless motor and gearbox are mounted transversely between the wheels. Drives both axles via intermediate spur gears. The chassis is milled from an aluminum block which also provides some much needed weight. Holes for axles, leyshafts and motor mountings all drilled on Colin`s small tabletop milling machine to ensure accurate centres. Not how Colin usually makes a chassis but I know he was pleased with it. The Triang bonnet was made 12mm narrower and 38mm shorter. A Ruston type gearbox housing was filed from a slab of polystyrene. The gear lever serving as the forward, off, reverse switch. Standard Ruston tractor seat from brass sheet, driver as usual carved from Holly. Canvas drivers canopy made from crumpled brass shim stock. Runs well, the combination of coreless motor and spur gear drive results in a PP9 battery lasting for many hours. It was Colin`s intention to build a batch of these overtype loco`s but he only completed one before his untimely demise. Features enclosed gear drive and internally gas fired boiler. There is little I can share about this project. 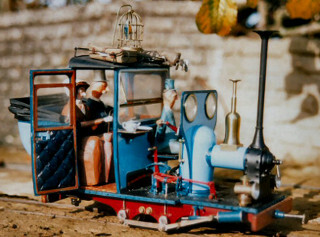 I found one sketch but no drawings and at the time Colin was building these my main concern was his poor health. From a photo` in the Encyclopedia of Narrow Gauge Railways by Thomas Middlemass. Thought it was a DeWinton working at Penrhyn Quarry, not so. Displacement lubricator and one of Colin`s steam motors is hidden in the water tank. Gas fired with the tank in the coal bunker. Just needs a few more dummy valve gear components and then it will be ready for its first steam test. I had to include least some of Colin`s S Gauge models. These are the only half decent images I have found. The models are not in my possession so not available for me to photograph. They were built when I was in my infancy, eons ago, so I cannot offer any descriptions. Just to share my childhood memory that they were built on the kitchen table with an Adept lathe and hand tools.